Some of you might be wondering why I’m having such a hard time with Helm’s Deep. The answer is because he’s my very first Sport Weight yarn. 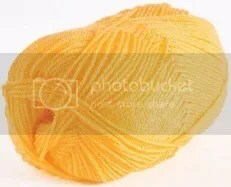 I’m a worsted weight girl. 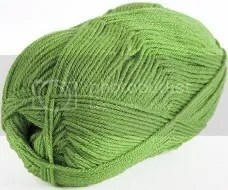 That is the yarn I started with, and it’s my favorite balance of yarn. Balance, as in it is big enough that knitting goes quickly, and small enough (to me), that my stitches don’t look enormous for the things I choose to make for myself. So I’m slowly branching out into other yarn weights. I’m still partial to machine washable/dryable yarns, as those are the easiest to care for; so the majority of my stash is acrylic and acrylic blends. However- I do own wool, I do own alpaca, I do own angora, I do own cotton, I do own silk (although I am not partial to 100% silk), and I do own bamboo. So I count myself good on fiber variety. And luckily- I’m not allergic to anything I have petted so far. I am slowly winding everything (that’s not already into center pull skeins) into center pull balls. It’s a slow process, but I bought more sandwich bags, so that everything that is not protected WILL be. And as soon as it’s wound- it goes into a sandwich bag. That means everything I own will be project ready. I will also be buying a bunch of silica gel packets. (FIFTY 3-gram packets for $7 on Amazon? Not bad.) Why? Because I live in Tennessee. And humidity plus most plastic storage bags equals moldy yarn. (The freezer bags tend to hold up better, but they’re also more expensive.) So regular sandwich bags, plus a packet or two (depending on the bag size) of silica should equal smooth sailing yarn-wise. Now- you need to replace silica packets around once a year. So- if I do spring cleaning of our yarn stash EVERY YEAR – I should be fine. No pesky moisture, and no unwanted animals (read: insects and arachnids). I will also be restricting myself to only three WIPs (this is Day 2 of Stash organization). One long term (which at present is my FIL mitred square blanket), one normal project (which right now is my Helm’s Deep trio), and one travel/movie knitting project (I am always in need of a simple mindless project to keep my hands occupied in a dark theatre/on a plane/in a car/or a slightly social or slightly familial situation). I may expand that to four WIPs, but I don’t want any more than two normal projects, one travel, and one long-term. More than that, and I start forgetting what I have on needles, and where I stashed them. I also want to have complete sets of accessories for each WIP. Right now- all my stitch markers, crochet hooks(for catching mistakes), finishing needles, and scissors are all in one place – an old eyeglass case. This is fine, except when I have to track down the eyeglass case (which happens fairly often). All my tape measures walk around (either on their own, or with help from the cat). My MIL started the retractible-tape-measure-is-a-toy thing with the cat looong before I met him, so I have to contend with him stealing my tape measures and batting them around the house. I don’t mind. They grow legs and walk away on their own, so why would I mind if they have help? So Helm’s Deep is mad at me. I base this on the fact that it is a tangled, gnarled mess, that I’m having to unravel, as I wind it into a center pull ball. Now- please note that I’m not blaming AHR at all. In fact- those hanks they put them in are a thing of beauty! And the way they wound it into hanks- I would have normally had absolutely no trouble winding it up. (In fact- this is the smoothest wound hank I have ever seen. No lie.) But I have waited almost a week to do more that pet Helm’s Deep, so he’s mad at me. Thus he is making my life difficult at the moment. Because he can. And he’s going to have to wait a few more days, because I can’t order his accent colors until tomorrow (Friday), which means they won’t show up until sometime next week. But- I have decided what I want to do: Neapolitan Mitts. 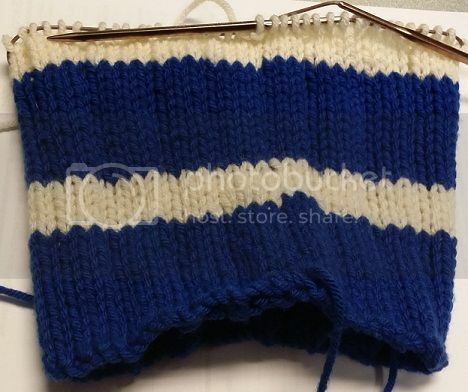 Once I get the concept for the colorwork down- I plan to continue it with a hat and vertically knit scarf. I plan to go darker to lighter, so the wrist part will be a close purple, then Helm’s Deep, then ending in white. 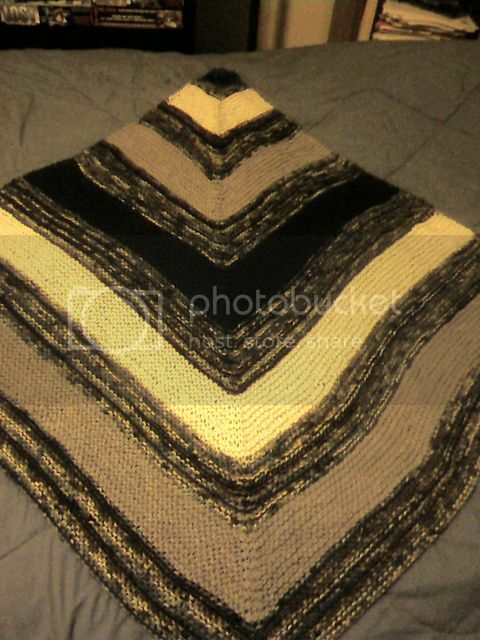 Funny thing is- stranded colorwork is supposed to be one of my fears. But my love for Helm’s Deep is so… well… DEEP, that it’s not bothering me. At all. Go figure. I almost chose Dapper Dame, but my brain said that I might want to start with something simple, so I don’t scare the crap out of myself. So- I will try Neapolitan Mitts. If it doesn’t look right, I will frog it and switch to Dapper Dame. And if all else fails- there is always Houndstooth. Actually- Houndstooth doesn’t sound like a bad idea… I rarely see it nowadays, so it may be time for a comeback! Maybe a tri-color Houndstooth? A normal sport weight hat is about 300 yards. A normal sport weight glove is about 200 yards (I hope that is a PAIR of gloves). A normal sport weight scarf is about 700 yards. So that’s about 1,200 yards total. Add 100 yards for user error, so that means I need about 1,300 yards of yarn. If I go with the Neapolitan color scheme- it’s about 70/30. 70% Helm’s Deep and 30% everything else. Crap- I don’t have that much Helm’s Deep. And I don’t want to invert the color scheme, so that throws out Neapolitan just on yardage. Dapper Dame looks to be a 60/40 mix, but I don’t think I would mind it inverted. So an inverted Dapper Dame color scheme would require about 520 yards of Helm’s Deep. That is doable. So I would need 910 yards of the accent color. Houndstooth is probably 55/45. if not 60/40. It’s not exactly half, as you use slightly more of the dominant color (which is usually the darker color). So if I invert the Houndstooth- it would require the same yardage as Dapper Dame. If I do a tri-color Houndstooth- I would have to decide which yarn is going to be dominant (or if I need to devise some sort of tradeoff). So it would either be 60/20/20, or 34/33/33. So I would need 780 yards of something and 260 of something else (accent colors), or 430 yards of each accent color. So to be safe- I need to buy 910 yards of one accent color, and 430 yards of another accent color. Brava is 273 yards per ball, so I would need 4 balls of the 1st accent and 2 balls of the second accent color. Since I definitely want to work with the Seraphim – I need 4 balls of wine and 2 balls of Seraphim. I’m going to make that 3 balls of Seraphim, just in case. It just doesn’t FEEL like 2 balls would be enough. Thanks for listening to me while I talked myself through it! So- I’m in love with Helm’s Deep. It’s been on my mind all weekend. I honestly don’t remember ever being so fascinated with yarn before. So much so that I had a hard time finishing my Rib-A-Roni hat. But I did! Tada! And after I was done- my lovely hubby reminded me that Tracy wants ear flaps. Crap. I don’t think ear flaps go with this pattern. At ALL. So I’m going to have to do ANOTHER hat for her. Well- I have time, as this is for her (American) football season attire. And I’m still working on the FIL mitred square blanket. That is definitely one of those ‘takes forever’ project. And while it is great mindless knitting- it’s getting too big to leave the house. So back to Helm’s Deep! (Which is a WIP, despite not being on needles yet, cause it has been blocking any and everything else I need to cast on. So I’m going to have to make something with it. 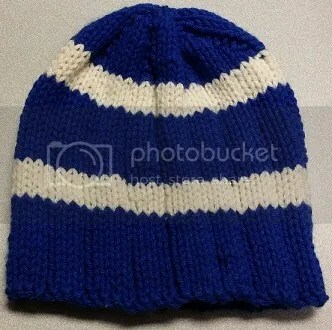 I think I’ll do a hat/scarf OR COWL/fingerless gloves set. The only thing is- I only have 548 yards. I will need a complementary color, if I’m going to get all three items. I think my best bet would be to go with a split-complementary color scheme for Helm’s Deep. So my main colors are grey and a Red/Purple variant. This is a little problematic, since grey is not on the color wheel; but I just imagine it to be darker than purple. So that means the complementary mid-point between grey and red/purple is yellow/green. I’m not sure I like that, and I definitely don’t want an all white complementary color. Or all black. Oh, and any other color variant suggestions (except PINK) are fine. Why not pick? Although I’m fine with knitting pink for other people- I’m not particularly partial to it for me. 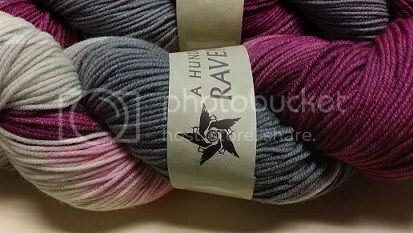 I think I’ll be using Knitpicks Brava as the complementary color, so it will need to be one of those. I had sooo much fun at the Stitches Market yesterday! Well- first I had to find the place. I parked at The Mills (next door to Opryland Hotel), because the Hotel wanted $23 for me to park. And that would take away from the money I had set aside to buy yarn. So no. Then I walked past the convention center and politely bugged the crap out of any Stitches attendee that I saw, to point the way to the Market. It turned out to be past the Conservatory. The Market is open till 6pm. What they DON’T tell you, is that they stop registration (and selling Market tickets) at 5pm. I arrived at the Registration booth at 5:02pm. But the Registration lady took pity on me and let me buy a ticket, anyway. (THANK YOU!!!!) So I had almost an hour to experience all of the lovely Market-y goodness. First thing when you walk in, were needles and books. Books on everything imaginable. If I had known about the books- I would have brought extra money and bought a few. But I was on a mission for yarn. I saw many hand-dyed yarns. And many hand-spun AND hand-dyed yarns. Yarn sellers– I know you are proud of your yarn, but some of it was scratchy and unpleasant to feel. It looked GREAT, but I would not necessarily want those against my body for any length of time. Perhaps they soften up after washing. I hope so. I passed on the scratchy yarns. 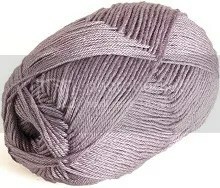 I did purchase a skein of Plush Worsted (Colorway: Amethyst) from Apple Tree Knits. I have no idea what it wants to be. Maybe a baby sweater. One of the things I definitely wanted to do, was to find A Hundred Ravens. 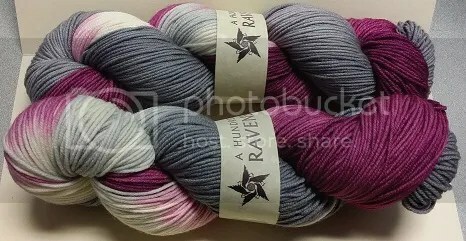 I’ve seen their website, and the colorways are GORGEOUS, but I’m always hesitant about buying yarn online without being able to FEEL it first. (Especially since a lot of these Stitches market sellers have online shops, and some of their yarns feel like an itchy nightmare.) So I wandered over to their booth and fondled just about EVERYTHING. I am happy to report that it all feels soft and wearable, and that I probably will be giving them my paycheck sometime in the near future. ALMOST. I had it in my hand! It looked lovely! And then I met Helm’s Deep. And I don’t know what to do with it. I figure since it was sooo demanding about choosing me, it will be equally as demanding about what it wants to be. I do know this- Helm’s Deep IS MINE. Whatever it becomes- it will be for ME. No giving this one away. What are your favorite knitting or crocheting magazines? With the honorable mention going to Simply Knitting. The Alan Dart toys are absolutely precious, but being that it is a UK magazine- it is price prohibitive for me to do a subscription. Simply Knitting – £77.99 (about $120 US) / £53.49 (UK) / £68.99 (Europe) / £81.99 (rest of world) — WHY don’t they offer a digital subscription?!?! There are (of course) LOADS more knitting (and also crocheting) magazines out there, but the ones I listed subscriptions for are the ones I see most often in my local bookstores/drug stores. I would like to find some Japanese knitting magazines (I hear there are a few over at YesAsia, so I will have to check that out). 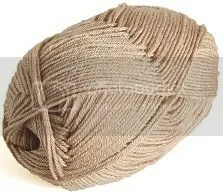 Speaking of Japanese kntting- did you know that the Japanese don’t distinguish between knitting and crocheting? It’s all the same thing (ami), it’s just one needle or two. This is why amigurumi just means knitted stuffed toy (or doll). There is also amirisu, an online Japanese/English bilingual knitting magazine. You can find the patterns for each issue on Ravelry. It doesn’t particularly look to be my cup of tea, but if any of you like it, then enjoy! I follow one of my favorite authors on Facebook. I won’t mention her name, because I don’t specifically want to influence you in any way about her. But I have been unlucky enough to have her tirade about libraries visit me several times since I started following her. In a nutshell- she hates the idea of libraries, because people BORROW books instead of buying them. So libraries are cheating her out of revenue. I think she is completely nuts (and wrong -ON-THIS-SUBJECT-), and I’ll tell you why. How many of us (and I’m speaking to the book lovers out there) have read a book we completely enjoyed, and then proceeded to recommend it to a friend. And when they mention that said book sounds like something they’d like to read, we say, “Oh here- you can borrow my copy”. This happens in thousands of cities all over the world EVERY SINGLE DAY. I bought a copy, and I can wallpaper my bathroom with it IF I WANT TO. (Although I actually cringe inside when I see books used for things other than reading or holding up other books.) Point is- libraries are not the only place this happens. And sharing your book is exactly what you WANT to happen as an author. You want your story out there. You want people falling in love with your characters. You want people to beg for more. It is building a following, and that is what you want. Because people who like what you write will buy your books. And if they fell in love with that first one, they will buy it (because they most likely either returned it, or shared it with someone else, so they still need a copy of their own). There are sooo many authors that I would not know about today, had I not found them in my library as a kid. It got to the point, that I would read something if the cover looked even halfway interesting. And that is how I found her books. And I do want to tell her that she’s wrong in this stance. And point out that I’m trying to track down some of her out of print books because I enjoyed them soo much that I want to own them. And I wouldn’t even know about them, had they not been in my library. But I’ve seen her vehemence on this subject, and I’m afraid it would fall on deaf ears. Oh, and if you book lovers out there are still lending out the books you love- take a tip from me: buy a copy to keep and a copy to share. This way you can KEEP what you love. Okay. So it is usually midweek that I update the blog on my WIPs. However- I think I’m going to move that to Mondays. Most of my progress is usually done on the weekends, so that makes a more impressive start to the week. However- I will provide a mini update. I STILL haven’t finished the Rib-A-Roni hat. I really need to just sit down and do it. I’m two hours (three hours max) away from finishing it, and I just keep plodding along on the FIL mitred square blanket. So that is my homework. Finish the hat. I expect to have it finished by the next OFFICIAL WIP post. I also (in organizing my stash) found another WIP on needles I forgot I even owned. Pretty sure they’re size 8 circular pink Boyle needles. That’s my favorite size. Not my favorite needles, but then- I have been completely spoiled by my Addis and Kollages. (I want to try the Signature Stiletto needles, but they are sooo expensive!) It’s a Weasley Sweater. Using Red Heart Soft yarn. (It’s funny how I know that brand just by look. Don’t need a label for those!) Again- not a problem, but I think I will rip it out, relax the yarn, and start over. I want to add faux seams and shaping, so it’s not just an over-sized frumpy-looking tube. So I’m not exactly counting this as a WIP, because I will not be restarting it for awhile. At least not until June. I have plans for things to come before it. Will be in my neighborhood from this Thursday to Sunday. I am excited. However- I will not be attending any classes. The truth is- I kind of forgot about it until last month. And upon looking- the two classes I REALLY wanted to take were already full. And the two other classes I kind of wanted to take were already full. And then things exploded at work. So. I honestly won’t have time to take off and attend classes. And while that is a shame- I can go and play with all the Market goodies. And maybe attend a Market session or two. And that is what I plan to do. So I started to organize my stash yesterday. Hubby thinks I have waaay too much yarn. I defensively stated that it was only enough to fill two 30-gallon bins, and even with that- the second one would only be half full. I just had to get it into some semblance of order, since I have a lot of donated scraps, and half-completed projects that I frogged, but never properly unraveled. So I started grouping things together. Anything that was at least 50% wool (not superwash), was placed in a gallon storage bag together. Anything that was at least 60% cotton has it’s own gallon bag. And of course- acrylics were grouped together. I like using storage bags- you can squish a lot in them, and pack them in the bin. And it feels like you have more room. You probably do, since you’re confining the yarn to a certain space, instead of just letting them roam free in the bin (like I had been doing). Even so- I have two cakes of mystery yarn. No clue where the labels are for them. And they don’t specifically feel like one thing or the other. They have some slight stray yarns (you know- the few strands that kind of stand up and wave at you) like alpaca or angora, but they don’t FEEL like either. And they don’t FEEL like wool, so I have no idea what they are. They’re probably equal parts of several animals, so that doesn’t really help me with my predetermined categories (Mostly wool… mostly cotton… mostly acrylic… mostly bamboo…). While I know almost certainly that they will be hand wash/dry flat- I don’t know where they should go. I also have several monstrous tangles of yarn, so I set about untangling them. 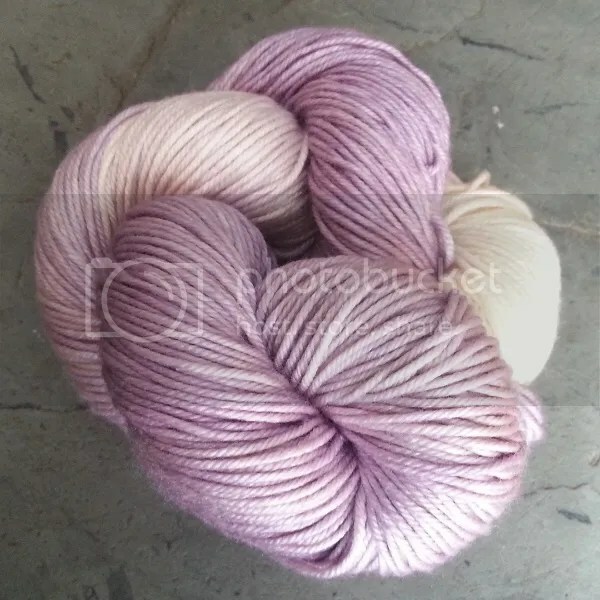 One acrylic ball of purple variegated yarn… several lovely blue balls that NEED to be a sweater were untangled. 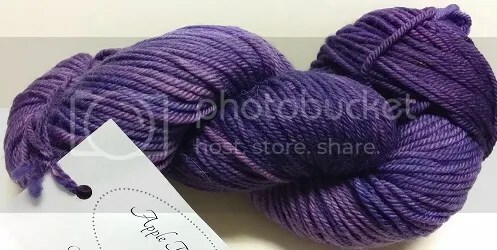 They have also lost their labels, but I know for certain that they are Red Heart Soft; so assuming they still produce this colorway- I can just buy more balls and set around to that sweater they are DYING to be. (I know, because they told me so last night.) I started on some angora rabbit yarn (I let a hank untwist and it has de-evolved into a nightmare. The other hank is fine. ), but did not get far in the untangling process, so that will be my homework for tonight. I also ran out of storage bags, so the sorting will have to continue when I get more. Ideally I want one bin dedicated to acrylic yarn, and one bin for everything else. Oh and I probably should mention that I have one bin that specifically houses my yarn BOOKS and magazines. But it doesn’t need sorting. However- when I move and can have a dedicated yarn space (read OFFICE)- I will have to find a way to make those more accessible. And then I’ll have another bin for yarn. Everybody wins! So I’m probably going to have to break down and get a Pinterest account. The answer is the fine print. I know most of you don’t read the fine print, but the Pinterest fine print basically says that ANY ORIGINAL THING you pin is THEIR property and they can use it any way they see fit. It also pretty much says that if you pin something that makes the original creator angry- they will give you up so fast- your head will spin. I don’t like either stance. It feels like I’m bait in a bear trap.